Daihatsu Batam has opened All New Terios bookings. The more elegant and stylish sport utility vehicle (SUV) class car will be paved in the city of Batam in early 2018. "Now, we have opened our reservation through our office in Palm Spring or through our exhibition at Kepri Mal and through Daihatsu's marketing," said Daihatsu Branch Head Alex Budianto to Wednesday ( 13/12/2017) afternoon. According to Alex Budianto, New Terios which was launched November 23, 2017 was very fresh. Because the start of the model, interior and engine changed completely. 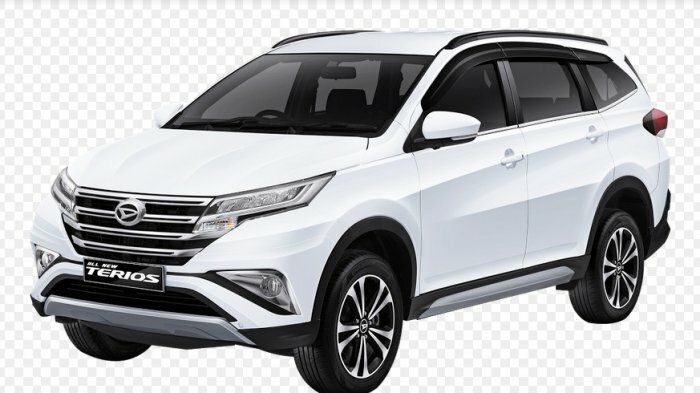 "This terios with seven seater concept with the latest 2NR-VVTi 1500 CC engine is more efficient, but still has the optimal performance," Alex added greeting familiar. Alex explained the latest Terios exterior is more luxurious and modern. Because it is equipped with advanced features that are suitable for those who are active with a variety of activities. "Currently Terios is already using stop start to turn on and off the engine, while the air conditioner is digital add passenger comfort by adjusting the temperature as desired," he explained. New Terios is also equipped with 2 DIN touch screen audio with various features such as around view monitors, mirroring and DVD players. "So it can make it easier for us to park the car," he continued. Not only that the latest Terios is equipped with more advanced safety features. Ie anti lock brake system '(ABS) and electronic. Brakeforce distributor (EBD) on all variants. "And vehicle stability control (VSC) and Hill start Assist (HSA) for the highest variant. SERVICE itself helps to accelerate stop on a hill," Alex caught. Alex also explained that Terios color variant there are six. Namely White, Scarlet-red-metallic, Purple-Metallic, Bronze Metallic, Classic Metallic Metallic and Midnight Black Metallic. "If the price is very affordable and relatively very cheap for the class of SUV cars," he continued. Alex ensures the New Terios can be present at the beginning of 2018. "Now this is the process of making and early next year can already be present in Batam," he concluded.